An affectionate and loyal friend, Butterscotch was tearfully relinquished to rescue by her elderly and recently disabled owner, who had to move from a large home in the Midwest to an apartment in a senior care facility. Once Butterscotch was taken into NCR foster care, volunteers discovered that she suffers from a painful condition called palmar carpal breakdown, so that she has to walk on her "wrists". 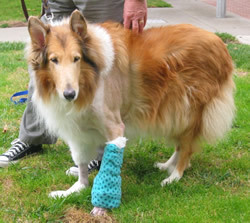 In spite of her disability, Butterscotch is the typical Collie companion, loving and wanting above all else to be with her human family members as much as possible. It came as no surprise that her foster family fell madly in love with her and decided to keep her. However, the NCR veterinarian gave her a poor prognosis with her collapsed wrists. Eventually the pain of walking on them and hyper-extending the tendons would be too severe to be alleviated by pain medication. At that point, the most humane option would be euthanasia. 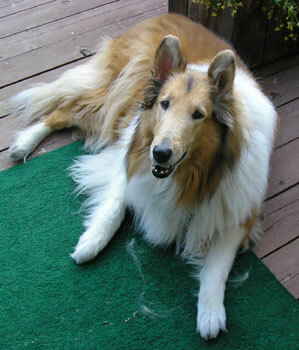 Butterscotch, a true Lassie, surely did not deserve both to be removed from her life-long family and then to live a too-short life. Treatment for her orthopedic condition would be very costly. Her foster/now adoptive family could not afford to take on this expense entirely by themselves. 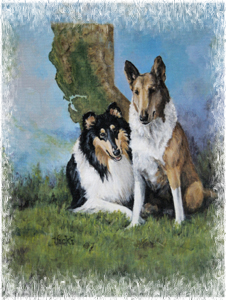 NCR called upon Collie lovers throughout California to help, and help they did. Within days, NCR received enough funds from the generosity of our donors to cover nearly all of Butterscotch s medical needs. The generosity of our donors has allowed NCR to not only pay Butterscotch s veterinary bills, including the cost of a custom brace for her right front leg (see brace), but now, we are going to be able to try a brand-new less invasive surgical procedure to actually correct her left front leg! If it works as well as we hope, we will do the right leg a few months later. 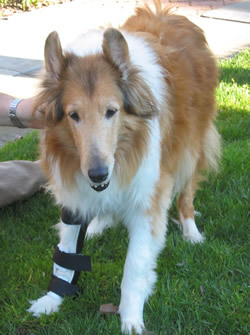 Orthopets has generously reduced the price of their brace for us and Dr. Gary Brown, a renown board certified Orthopedic Vet is offering Butterscotch a special deal for the surgical procedure (It is enormously generous, believe us!) for her palmar carpal breakdown, so that she no longer has to walk on her "wrists.” Right now, her front paws almost look like a long, flat human foot. Butterscotch s new adopters will be assuming her follow up care, which is a lot to ask, but they fell head over heels in love with her and would do anything to help. They are able to afford to give Butterscotch a permanent, loving home because of YOU. Butterscotch’s surgery is scheduled for Tuesday, July 31st. We will continue to post updates as the process evolves. Butterscotch s surgery has been delayed. After they gave her the necessary drugs, they shaved her leg to prep for the surgery and found acute dermatitis. The vet explained that if he cut into that leg, it would become infected. He prescribed her antibiotics and a special shampoo. The surgery will be rescheduled soon and we will let you know the new date. After a number of delays, Butterscotch had her surgery on Wednesday afternoon (August 22). She stayed at Dr. Brown s until Friday afternoon (yesterday) and everyone there thought that was a good idea. Between Thursday and Friday she progressed really well. After we brought her home late yesterday afternoon she was quite agitated and her temperature began to rise so Chuck drove back to Fremont at 9 pm to get a light sedative and another antibiotic for her. The sedative did the trick -- we only had to give her one dosage and she s been calm ever since. Her temperature dropped once her stress level dropped, so we never had to give her the second antibiotic. She s doing much better today. She s able to walk outside to pee and had her first real meal. She looks awful with her side shaven (there are some shave burns that I m treating), but she is more alert and aware today. All-in-all, she s doing very well. Chuck is taking her back to Dr. Brown s twice next week for a check and bandage change. He is taking off work Monday and Tuesday (and working at home on Wednesday) to be here with her and of course, we ll both be here with her over the Labor Day holiday. Dr. Brown is very pleased with how well her leg is healing and her pain has diminished significantly in the last several days. In the photo where she is standing, you can clearly see the improvement in her stance on the left side. She did develop a pressure sore after the surgery but that, too, is healing nicely with daily bandage changes and vigilant monitoring. Unfortunately, she can t wear the leg brace on her right leg while she has the rod/pins on her left leg because the two devices keep hitting each other & she ends up tripping. 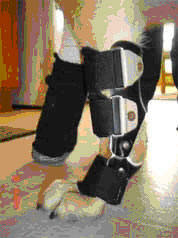 The brace will be most useful after the rods/pins come off towards the end of October. It will then allow her to walk normally by lifting her right side up to match her newly-fixed left side until her second surgery, which will take place about 2 months later. Please relay our gratitude to all those who donated money for Butterscotch. This incredibly sweet dog has never lost her kind and gentle demeanor throughout, and she just can t get enough hugs, kisses and belly rubs from us! We are so lucky to have her and we re grateful to all those who made this procedure possible. FYI -- Dr. Brown and his staff have been absolute gems! 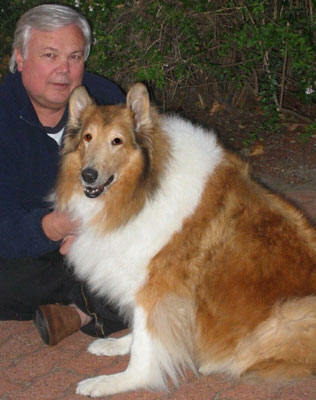 You re very lucky to have him as part of your collie rescue team. He continues to be incredibly generous with his treatment of Butterscotch. She s doing well, is much more alert, and seems anxious to be able to go outside and play again soon! second surgery. She ll surely need it -- there is quite a difference between her height on each side and the brace will give her a normal gait until the surgery. 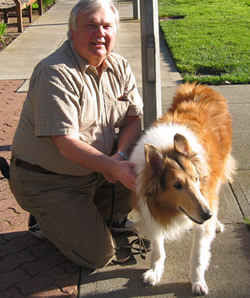 Again, we can t thank NorCal Collie Rescue, Dr. Brown, his wonderful staff, or the donors to the "Butterscotch Fund" enough for all you ve done to give this beautiful collie a better life! Unfortunately, the bone in her foot did not fuse completely and after a few days of normal pressure on it, the fusion was reversed altogether. 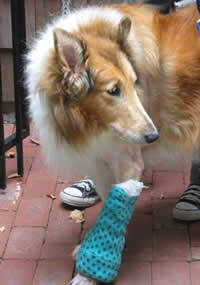 She has a splint on her leg so she s able to walk. Dr. Brown will be putting a plate in her foot on Tuesday; she ll be home on Wednesday. The recovery should be much easier and we re hoping it will be quicker since some of the "work" from the first surgery is still in place so there isn t that much for him to do. We feel terrible putting her through this again but since she didn t have any adverse reaction the first time we re expecting all to go smoothly again. As usual, Dr. Brown and his team have been unbelievable -- so compassionate, loving and generous! We re starting to feel like we re one of the "family," which is so nice considering the circumstances. Butterscotch is doing beautifully! Dr. Brown feels that the plate insertion will solve the problem with her left foot forever. She came through the surgery very well -- better than the first time -- and is bright-eyed and alert. 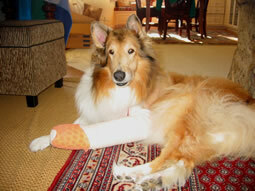 Chuck took her in yesterday for a splint change and it s healing fine. So far (cross your fingers), all is well! Butterscotch s leg is healing exceptionally well according to Dr. Brown. He took the hard cast off last week so she just has a heavy bandage on it now. It still isn t completely healed, but she s making very good progress. Either next week or the week of New Years she will have new x-rays taken and, depending on the results, the bandages may come off completely! We will be celebrating that day, to be sure. 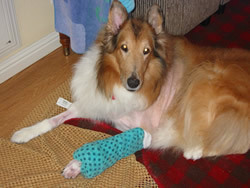 She looks the same right now; I ll send you updated photos once the bandages come off. Finally! Butterscotch is doing just great. She's visibly perkier, happier, and more curious about her surroundings. I've attached some updated photos of her, including a close-up of her front paws where you can clearly see her fixed left paw and how far "down" she is walking on her right one (which is next for surgery -- probably in early April). Until then, the brace is a big help, as you can see. 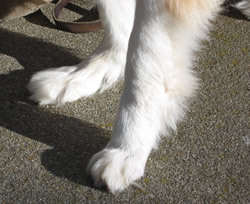 Once her second foot is done, we'll start looking for a companion for her -- another older dog, though this time perhaps a collie who doesn't have the health problems we've encountered with Butterscotch. Although Dr. Brown has been terrific in absorbing costs, we're emotionally drained at this point. Love her to death, though. She is absolutely the sweetest thing and we don't have a single regret about adopting her! Butterscotch had surgery on her right leg on Wednesday and is doing really well! Dr. Brown reviewed the x-ray with us this morning and he s very pleased with how it looks and how she s doing. She is already putting weight on it and is so much happier. Her leg was really bad -- it was getting visibly worse and causing her more pain. It got to the point where the brace was hurting her more than it was helping. The only reason we didn t do the surgery earlier was because she had a bad case of dermatitis and they can t cut into the skin with an infection present or it would quickly spread internally. For nearly two months we bathed her 3x/week with a medicated shampoo and gave her antibiotics to fight the dermatitis. During that time, though, her leg got so bad that we didn t want to delay the surgery any further once the dermatitis was gone. I haven’t had the heart to post this last update from Bonnie and Chuck until now, because it was so upsetting. I’m still not over the shock. This is just too unfair! We had to put Butterscotch to sleep on Thursday. We are absolutely heartbroken; her leg was healing well and she seemed fine until last Saturday, when she began tripping over the newest splint. We took her to Dr. Brown s on Saturday evening (emergency clinic) and they found the splint had slipped, so they redid it. On Tuesday morning I noticed she was lagging in her walks; by the time we got an appointment with Dr. Brown on Wednesday she would hardly walk at all. He knew immediately after watching her walk that it was either a spinal tumor or a herniated disk. An x-ray showed what could be a major disk problem. He gave her a pain killer and prednisone and told us that the prednisone would help a lot, which would give us time to get a second opinion and consider an MRI/surgery. Instead of improving, she deteriorated rapidly. We consulted with Dr. Gregg Kortz in Roseville (a fabulous neurologist) and he was not hopeful considering the ineffectiveness of the prednisone, her age, and the fact that she hadn t yet gained back her full strength after her previous surgeries. Butterscotch was within days of having her final splint removed when we put her to sleep. It seems so unfair that she went through so much in the last year and didn t get a chance to run and play again like a true collie, or enjoy the companionship of our newly adopted rescue collie, Parker. She was such a wonderful, loving spirit -- grateful and loyal to the end. I so wish that the story of Butterscotch s rescue had ended differently. We miss her terribly and will always remember your support and the generosity of those who donated to her care through your website, as well as that of Dr. Gary Brown in Fremont and his wonderful staff (who also shed some tears on Thursday). Everyone was pulling for her, and I know that they share in our disappointment and our sadness over her loss. Please pass my thanks on to everyone who helped us with Butterscotch s care.